It's that time again . . . Peach Season in Arizona! I have a lovely peach tree I purchased probably 5 years ago from a local nursery called Elgin Nursery on McDowell Rd, west of Loop 101, south of the Sam's Club on 83rd. This tree was grafted with 5 different peaches. That means fresh peaches over a 2 1/2 month period! Yea! So today per the request of my beloved Will, I have a lovely Crusty Peachy Peach Cobbler bubbling away in the toaster oven! The smell is a-maz-ing . . . Fresh, juicy-ripe peaches, a hint of cinnamon, and delicate biscuit with a golden-crunchy sugar topping! All it needs is a scoop of vanilla bean ice cream! 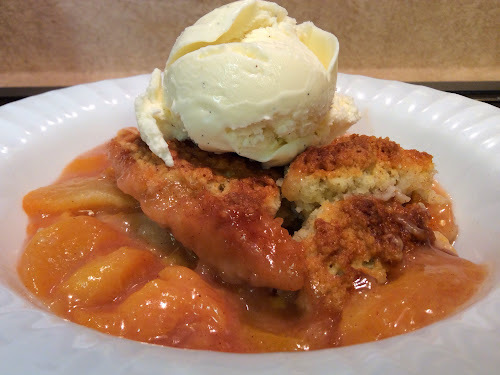 I love this recipe because adding this extra little step takes my cobblers from very GOOD to GREAT!!! ~ Pouring boiling simple-syrup over the dough gives an added sweet-crunch to the biscuit's outside and a moist, delicate crumb to the inside! 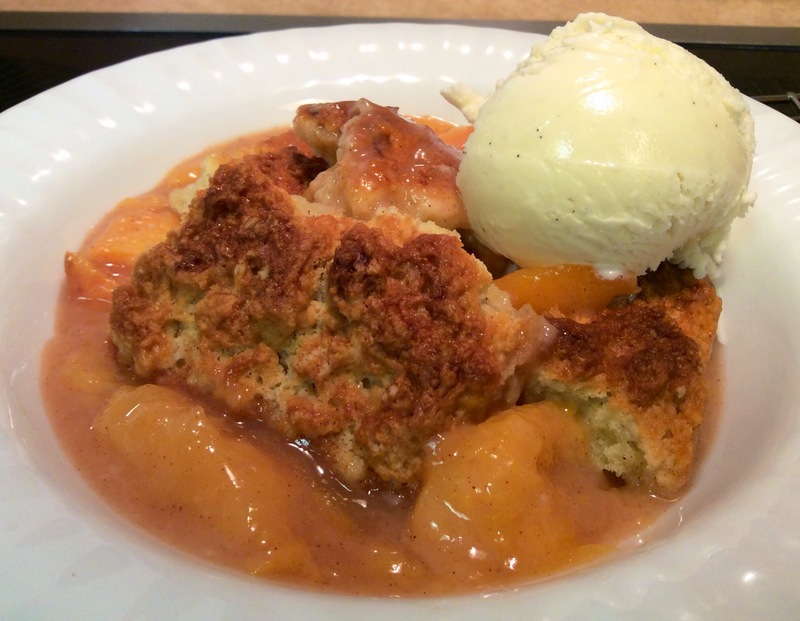 For the fruit, my take on take on cobblers is this, "If 3 cups of fruit are called for in a recipe, double it!" Note, the peaches stand alone, without sugar. 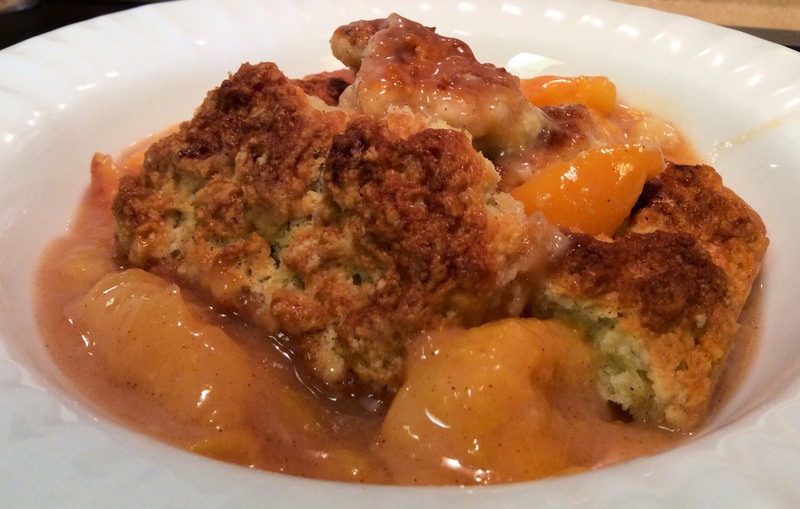 The star of a peach cobbler should be the peaches! Fresh peaches . . . Their aroma is intoxicating! With or without ice cream, this is a "must have" dessert! Dunk washed, ripe peaches into boiling water for 30 seconds to loosen their skins. 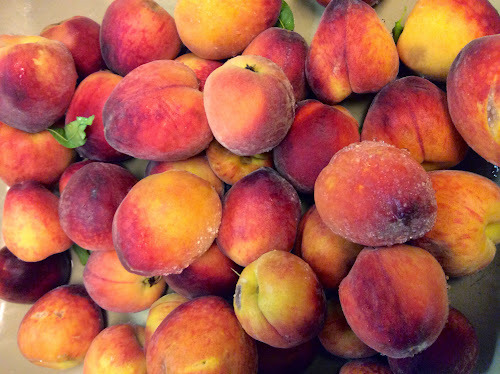 Transfer hot peaches to a bowl of iced water to cool peaches quickly; slip skins. 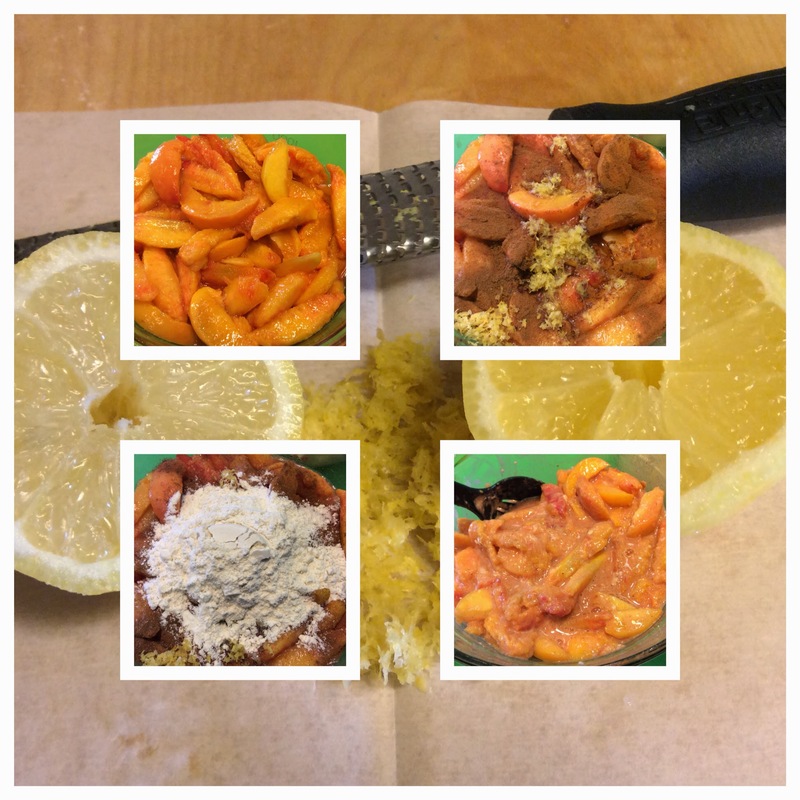 Slice peaches into a large bowl; add lemon zest, lemon juice, cinnamon and 1/3 cup flour; toss to mix well; set aside. In a mixing bowl add 1 1/2 cups flour, baking powder, salt; whisk well. 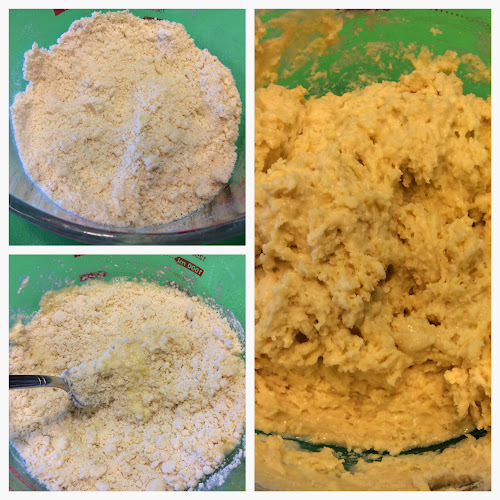 Cut cold butter into 1/2-inch cubes; rub butter into flour mixture using your thumbs and forefingers until flour resembles course meal. In a measuring cup beat egg; pour milk into measuring cup until it equals 1/2 cup. Add egg and milk to dry ingredients; mix lightly with a fork. 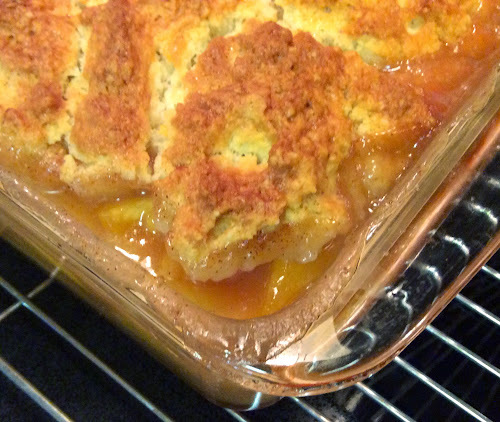 Pour prepared peaches into 8-inch x 8-inch baking pan. Top with spoonfuls of biscuit; pour boiling simple syrup and melted butter over the top of biscuit. Bake at 375°F. for 35 minutes, or until crusty and brown. I can't say enough about how delectable this dessert is! Let's face it, when peaches are at their peak of flavor and juiciness, we need to take advantage of their delicious goodness! I already have 3 peach pies tucked away in the freezer (for later) and a "hot from the oven" Crusty Peachy Peach Cobbler to satisfy our tummies right now! . . . Over at Julie's!!! Seconds . . . Anyone?